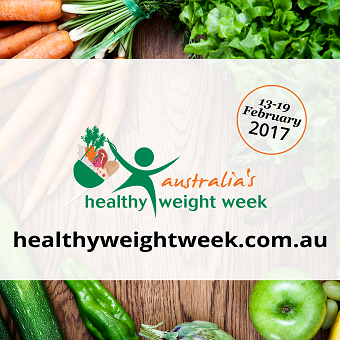 Australia’s Healthy Weight Week (13-19 February 2017) is an initiative of the Dietitians Association of Australia, raising awareness of the importance of achieving and maintaining a healthy weight and lifestyle. With many Australians aspiring to eat better in the New Year, the campaign aims to inspire people to cook at home more often. Research shows that people who prepare food at home are more likely to eat smaller portions and take in fewer kilojoules and less fat, salt and sugar. And in turn, this is more likely to result in a healthy weight. To get some inspiration, have a look at the delicious and nutritious recipes in the Everyday Healthy: Seasonal, Fresh & Tasty downloadable cookbook. To celebrate the 10th campaign, this Bumper Edition contains 14 healthy recipes including some of your favourites and some brand new dishes. Events are run around the country by Accredited Practising Dietitians, particularly fun activities that promote achieving a healthy weight, such as fun runs, walks, kayaking, healthy breakfasts and morning teas, stalls, cooking demonstrations, games and displays. If you’re in Sydney, there was a launch event in Pitt St Mall on Monday 13 February, with cooking demonstrations by Sprout duo, award willing celebrity cook Callum Hann and Accredited Practising Dietitian, Themis Chryssidis. Other ways for you to get involved included an Instagram cooking challenge competition.